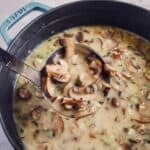 Vegan mushroom soup with delicious caramelized mushrooms, aromatics, coconut milk, and flavorful broth. In a dutch oven or soup pot over medium high heat, add 2 tbsp olive oil, diced yellow onion, sliced mushrooms and fresh thyme. Sauté for about 10 minutes until onions have softened and mushrooms have cooked through. Add in the garlic and cook an additional minute, until fragrant. While the mushrooms cook, in a medium bowl, whisk together the lemon juice, tamari, vegetable bouillon and coconut milk. Set aside. Add the 1/4 cup of flour to the mushroom mixture and stir until the flour is absorbed and no longer seen. Take the coconut milk mixture and slowly whisk into the mushrooms. Add in the vegetable broth and whisk until there are no lumps in the broth. Allow the soup to come to a light boil then reduce the heat to low and allow the flavors to meld for 10 minutes. Taste and adjust salt and pepper if necessary and serve. If you do not need soup to be vegan you can substitute vegetable broth with chicken broth and also use whole milk instead of coconut milk.